We think orchids are perfect for the Valentine in your life! 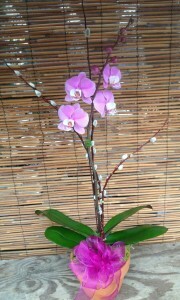 Would your Valentine like this pretty orchid? Call us and place an order soon and we’ll be sure to pick out the prettiest orchid for your sweetheart! Remember we also can put together a gorgeous arrangement of plants and flowers as well. Either choice will last far longer than cut flowers. 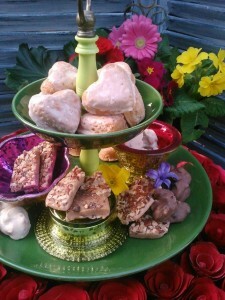 Sweet treats for your sweetheart! If sweet treats are more to her liking, we’ve got what you need there too! Shown here are some of the goodies the ladies from Seven Winds Kitchen have cooked up for us, including heart shaped mini teacakes, chocolate covered pecan and peanut clusters, and amazingly wonderful toffee…We sampled them all and have to say, you can’t get much tastier! Call and place an order and we’ll have it ready when you are! Remember, we also deliver – call us to set up your order and delivery. This entry was posted in Flowers, Gifts, Holiday, Orchids, Seven Winds Kitchen and tagged arrangements, delivery, February, gifts, orchid, peanut clusters, teacakes, toffee, Valentine's Day on February 9, 2013 by Kris Blevons.